I'm really conflicted here. While I hated that teaser trailer for Astro Boy that hit in November, new images have popped up and I'm starting to wonder whether my opinion was wrong that first time. That teaser looked ridiculously cheesy and just plain bad, yet these images remind me of Hayao Miyazaki or even something from Pixar. Stop messing with my mind Imagi! The animation house has released a batch of new concept art photos for Astro Boy on their official website this week. 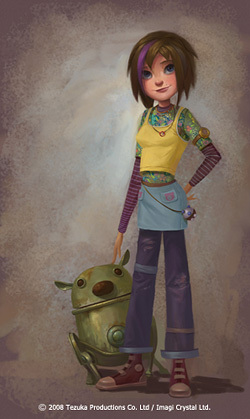 This isn't the first time we've seen some cool concept art for this movie, which is why I'm still really conflicted. Trust me, I really want this to turn out awesome in the end, so as long as it turns out as good as all of these images look, I'll be satisfied. Set in futuristic Metro City, AstroBoy is about a young robot with incredible powers created by a brilliant scientist to replace the son he has lost. Unable to fulfill the grieving father's expectations, our hero embarks on a journey in search of acceptance, experiencing betrayal and a netherworld of robot gladiators, before he returns to save Metro City and reconcile with the man who had rejected him. Astro Boy is directed by ex-Disney animator David Bowers, of Flushed Away previously, with a screenplay written by Timothy Harris, of Brewster's Millions, Kindergarten Cop, and Space Jam previously. Imagi Animation, the studio behind TMNT last year, is developing this animated film which is based on Osamu Tezuka's manga series. Astro Boy will arrive in theaters everywhere on October 23rd, 2009.
that's some great concept art im really diggin the look of this film, even if it does turn out bad at least it will go down in style. Yea, still doesn't really do it for me...maybe if they changed Astroboy to a blue color and called him Mega Man it'd be more appealing. any chance of this concept art in high resolution? 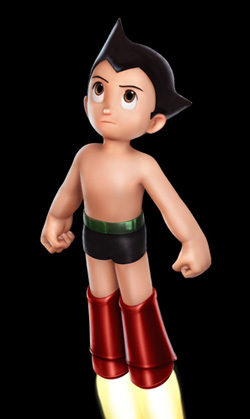 I believe in Astro Boy~this will be a BIG HIT!